If you read my posts last week, you'd know that me writing to you today means that I SURVIVED ZUMBA! It was so much easier than I thought it would be - but don't let that fool you! I used muscle groups I haven't used in quite some time so it's safe to say girl was sore yesterday. But what does one do when they return home from Zumba and their husband is out and about at the hardware store spending a fortune? Why, you perfect recipes for the blog of course. Luckily for you, this recipe is a ridiculously delicious one. 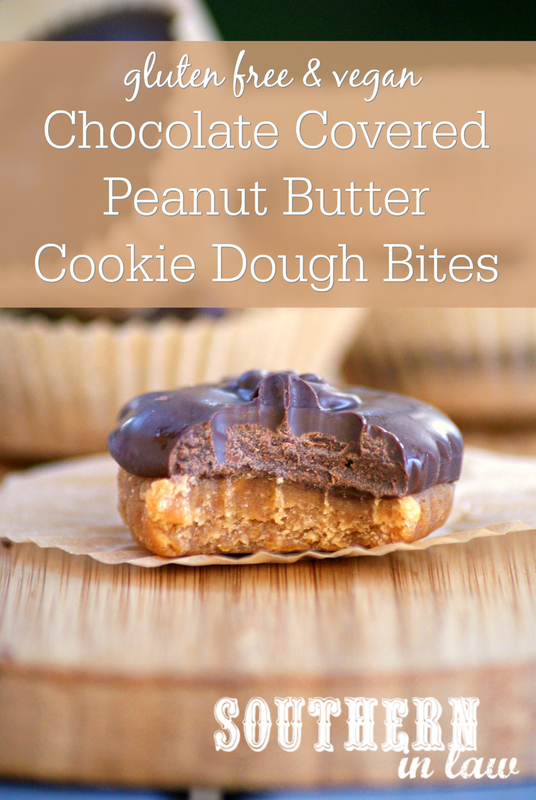 A couple of weeks ago I decided I really wanted to make chocolate covered peanut butter cookie dough balls and I set to work.... but whilst the end result was delicious, I found myself frustrated with an entire kitchen covered in chocolate and knew that just wasn't going to do. So I forgot about the recipe for a little while - until yesterday. 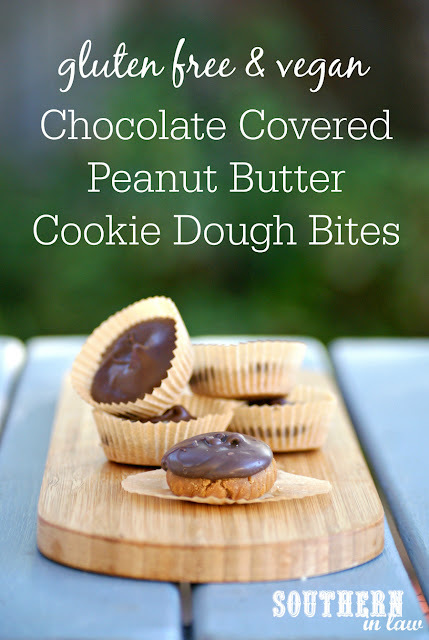 I already knew the cookie dough part was perfect - but I needed to come up with an easier solution - and thus, my friends, these peanut butter cookie dough bites were born. Forget chocolate dipping and dunking, slicing and rolling - this recipe is ridiculously simple and comes together in a matter or minutes. But be warned, somehow husbands have this homemade treat radar and will arrive home just as your cookie dough bites are ready to be taken out of the fridge - and promptly devour them. 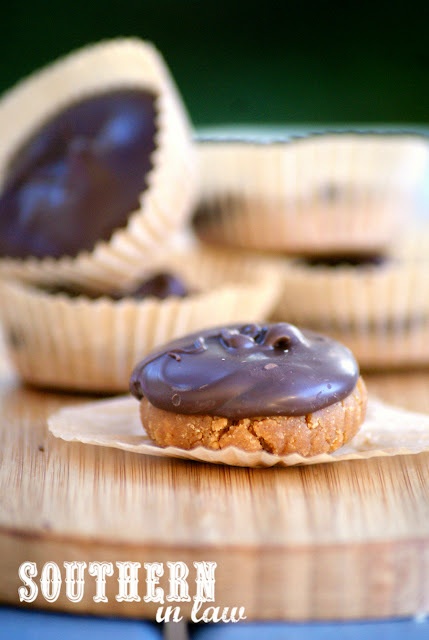 The recipe below gives you the option to either make your own raw vegan chocolate - or just melt your favourite milk or dark chocolate, however, it's delicious either way. Option two: Melt 1/2 cup (90g) coconut oil with 3-4 tbsp maple syrup in a small saucepan. Once melted, add in 1/2 cup (40g) unsweetened cocoa powder and a pinch of salt, mixing until smooth. See full directions for making the homemade coconut oil chocolate here - simply follow the preparation recipe but pour your chocolate over your cookie dough base instead. Line a 24 hole (or 2x 12 hole) mini muffin tins with paper liners and set aside. To make your cookie dough, add your oats to a food processor, pulsing until finely ground. Add in the rest of your ingredients, pulsing until combined. Add in a small amount of water (1/2 tsp at a time), pulsing until your mixture starts to form a dough. You don't want it to be too sticky so let it mix and stop adding water as soon as it starts to come together. Take your cookie dough and divide it amongst your paper liners, pressing the cookie dough out to form a layer (alternatively, you can just roll them into balls and leave them as is - that's what we do when we're being lazy!). Cover your cookie dough bases with your melted chocolate or homemade chocolate and chill in the fridge until set. 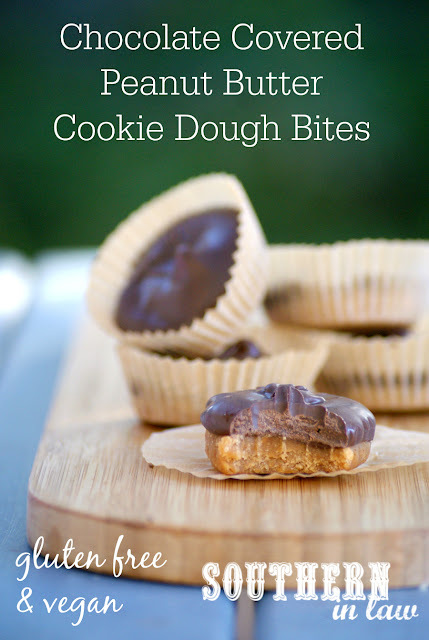 If you cover these with melted chocolate they will only take a few minutes to set and can be kept out of the fridge for longer periods of time. If you're using coconut oil chocolate, these will need to be kept in the fridge as the chocolate will start to melt quite quickly - they will also take a litle while longer to set. *Find out more about Oats on a Gluten Free Diet. If you cannot eat oats, you can substitute 3 tbsp gluten free plain flour. **If you don't have peanut flour you can use 1 cup roasted peanuts instead. And what's one cooking technique you never seem to have the motivation for? For me it's coating anything in chocolate or icing or anything liquid related - or rolling out dough or cutting butter into a mix. Lazy girl cooking right here.